High-value, highway line-haul, all-position tire. 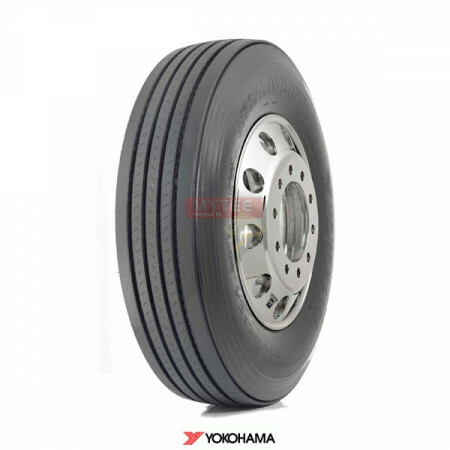 Yokohama has earned a reputation as a reliable performer with products that have been regarded as an exceptional value. The RY617 has all the traditional Yokohama qualities that savvy buyers have come to rely upon, along with the latest features that deliver long, even wear, enhanced wet traction and durability. Five-Rib Tread Design & SC Sipes - Our revered five-rib design is the perfect all-position high performer. Now enhanced with over 6,000 sipes, this premium feature provides excellent water evacuation and uniform wear. The stress control sipes are also especially effective in combating river wear. Stone Ejectors - Stone ejectors deep inside the tread grooves keep stones from imbedding into the tire to minimize drill damage for increased tread durability and casing life. Stress Wear Control Groove (scg) - This proven feature, reduces contact pressure at the tread edge, providing increased resistance to shoulder step down wear and enhancing long even wear, particularly at the shoulder area. Variable Contour Groove Wall - The special contoured design of the groove walls provides added rib stiffness that further combats uneven tread wear.